One of the best things about Colombia has been the Colombian people themselves. They are extremely friendly, always asking us if we are enjoying their country and then offering suggestions as to what we should see next. 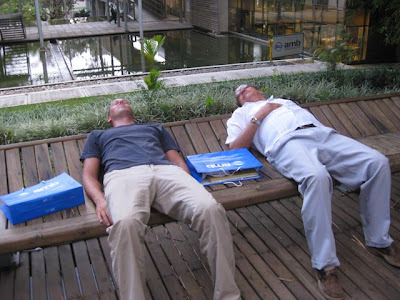 When Marcelo, a colleague of my father, found out we were traveling in his home country, he suggested that we visit his family in several cities across Colombia. While we have never met either Marcelo or his wife Vicky in person, we were warmly welcomed by Vicky's parents and sister when we entered the hilly green city of Bucaramanga. Staying with the Ricaurtes for 3 days, we were introduced to a city not often visited by foreign tourists, but with plenty of wonderful attractions. The city clings to steep and forested hillsides, spreading across a lush valley, and is known in Colombia for its excellent universities and beautiful parks. We visited the old colonial city of Giron, with cobblestone streets and whitewashed buildings that is quite typical of Colombia. We also took a very interesting tour of the local district's water purification plant that has been turned into a beautiful parque del agua (water-garden park) open to the public. Since David is close friends with the president of the water district, we were able to get a private tour of the park on a day it was closed to the public. We were also given lavish gift bags complete with samples of water and a beautiful picture book of Bucaramanga. On our last day with the Ricautes we visited the spectacular Cañon Chicamocha, the beginning of the Andes mountain range. enjoying the sounds of water falling in front of them. We had a great time visiting all of these sites, but our favorite part of Bucaramanga was getting to know the Ricaurtes. Vicky's parents David and Lilia made us feel a part of the family while we stayed in their home, introducing us to several Colombian delicacies and speaking in Spanish very slowly so Chris and I could easily understand them. Catalina, Vicky's sister, was the perfect host and tour guide, helping translate when Chris and I became confused (a frequent occurrence) and providing a great history lesson on Colombia. Words can not adequately describe how welcoming and friendly the Ricautes were to people with only the most tenuous connection to their family. Every time we thanked them for their generous hospitality, they sincerely responded 'con mucho gusto' (with much pleasure). We can't wait to arrive in Bogotá to meet more of the Ricaurtes, Vicky's other sisters Karina and Susana. Driving 5 hours northeast from Cartagena along the Caribbean coast of Colombia, we arrived in Tayrona National Park. The park stretches for 34 miles along the coast, and ranges from lush jungles to dry forests. The first night we camped under palm trees and listened to the waves crash on the beautiful Cañaveral beach a short path away from the campsite. While this beach is stunning, the severe waves and extreme currents make it very unsafe for swimming. Some time in the future when we aren't on a budget, we want to come back here and party like rock stars in the amazing 'eco-habitations' placed throughout the jungle covered hills with spectacular views of the beach. These luxury cabins have spectacular views of the beach, and have the architectural style of the Kogui, the local indigenous people. A 45 minute hike through the jungle led to the sparkling white sand beaches at Arrecifes, where huge boulders jutted out of the turquoise waters and it was safe to swim. Wanting to see more of the diverse park, we drove for about an hour to enter the west park entrance and a different world. Leaving the thick jungle, we drove through steep hills covered with red rocks and cactus to arrive in the starkly beautiful Bahia de Concha. Dry hills with scrubby brush rose dramatically around the horse-shoe shaped bay. We rested on the hot beach, relaxing for a day before our long drive ahead. Tomorrow we head south 12 hours to the city of Bucaramanga, where we will be staying with friends of the family. As an introduction to Colombia, you can hardly do better than to start in the gorgeous city of Cartagena. Founded in 1533 as an important Spanish port for shipping gold pillaged from the native populations of South America, the town was besieged by pirates many times in its first 50 years. To protect the town and all of its plundered treasure, the Spanish erected a huge stone wall around Cartagena. Since this wall successfully repelled subsequent pirate attacks in the 17th century, the old section of Cartagena is one of the best preserved colonial towns in all of Latin America. We wandered its narrow shaded streets, admiring the colorful buildings and ornate balconies. We cooled off during the sweltering days by gulping down icy jugos (juices) and snacking on freshly cut fruit available from street vendors displaying their wares on small wooden carts. In addition to the succulent and juicy watermelon, mango, and pineapple, Colombia has an amazing variety of tropical fruits, many of which I had never even heard of. I sampled them all: tart lulo, delicious maracuya, mildly sweet zapote, and strange but delicious tomate de arbol. While the colonial architecture and wonderful food is enough to make anyone fall in love with Cartagena, we also were struck by how friendly the Colombian people are. We had waiters, police officers, a television crew, and random people on the street strike up conversations with us. They are curious where we were from and also want to tell us about the history of Cartagena. They are proud of their country but also know that many people have preconceived notions about Colombia because of the many years of violence and fear caused by drug wars and guerrilla organizations. We quickly understood that this is in Colombia's past, and that except for a few isolated areas in the jungle the country is very safe. Colombians keenly want the world to know the country for what it is now: welcoming people, beautiful beaches, stunning mountains, and wonderful cities. One refrain we heard often as we strolled the streets, ate at restaurants, or browsed in vendor's stalls was a la orden, or at your service. This was meant honestly and we felt like it reflected the Colombian peoples true welcome for any foreign visitors. Sailing the San Blas Islands of Panama for three days on the sailboat Sacanagem, we entered an unspoiled paradise of pristine white sand beaches, small palm studded islands, and enough fresh seafood to satisfy the hungriest stomachs. The San Blas Islands are controlled by the Kuna Indians, a semi-autonomous indigenous group in Panama, but the majority of the hundreds of islands in the San Blas archipelago are uninhabited. We spent the first two days moored between two small islands that were home to about four Kuna families. The days were hot and breezy with plenty of snorkeling, swimming, reading, and cooking to keep us happy. We spent the cooler nights eating on the island and getting to know our fellow travelers. We were quite the international crew: we spanned the globe from Italy, Germany, Australia, and New Zealand, to Canada, the US, and Colombia. The third evening we anchored in a small bay that was once used by Captain Morgan as a hiding spot, although we didn't find any pirate treasure. For our last night in Panama, our underwater allies put on a great show when luminescent squid surrounded our boat and floated slowly by, twinkling their eerie lights. Chris has always dreamed of sailing around the world, so we figured some time on the open ocean crossing between Central and South America would be a good way to gauge if we ever wanted to make that dream a reality. On our way out to the Caribbean, we picked up two confused Koreans who seemed somewhat stranded in the San Blas. They spoke no Spanish and almost no English, but we think they had been waiting for the last four days on a tiny island hoping for a ride to Colombia. The captain of our boat referred to them as the chinos (Chinese) for the rest of the trip, as their true nationality appeared not to be an important detail to him. Once we left the area protected from the waves by the San Blas islands, the seas became rough and the swell really picked up. We had naively assumed that the Caribbean would be a placid turquoise ocean with gentle waves lapping the sides of the boat. However, our small yacht took stomach-losing drops and sickening rides over huge waves. Although I had been drugging myself with the maximum daily amount of Dramamine, I quickly had a death grip on the boat's railing as I stared desperately at the horizon in a vain attempt to quell increasingly overwhelming nausea. I added some chum to the ocean off the back of the boat into what looked like a sea of stars, as the waves were again lit up by luminescent creatures. After that, I laid on the floor of the boat in the fetal position praying to every and any god to make the boat go faster. My fellow boat-mates quickly became accustomed to my prone body at the aft of the boat, easily stepping over me to move through the kitchen to the boat's deck. The first day I tried to amuse myself by listening to podcasts on my iPod, but after its battery ran out, I could do nothing but stare at the people’s feet around me. When morning arrived the next day, I hopefully looked for land on the horizon. I was crushed to hear the captain tell us that the winds had shifted so we would sailing for another 24 hours. Meanwhile, the sea worsened as huge rolling swells washed over the ship, causing periodic avalanches of stereos, plates, books, or pots and pans in the galley. 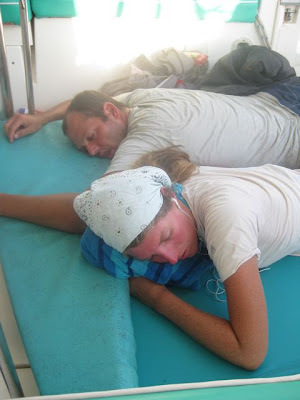 Chris slept next to me on deck the second night, although we were twice awakened by people falling on us as the ship pitched unexpectedly below their feet, and once rudely awakened when a huge wave crashed over top of the boat drenching our only blanket. By hour 40 of our crossing, the chinos had barely been seen outside of their cabin. The captain commented that they were like "popcorn", laying on their bed bouncing up and down through the rough seas. I did manage to crawl to the front of the boat as the skyline of Cartagena appeared in the distance on the third day and gazed hungrily at the land for the last 2 hours of the trip. I now have serious doubts that sailing around the world will be one of my life's accomplishments. Once on shore, we all went out to dinner to toast our survival. We were not joined by the chinos though. Last we heard they spent two to days resting in their hostel eating bananas, and then disappeared as mysteriously as they came. Today we embark on the only marine portion of our journey down the Pan-American Highway. After spending about 2 weeks in Panama City, we have organized boat trips both for ourselves and our cars to Cartagena, Colombia. The Pan-American Highway is continuous from Alaska to Argentina except for a 30 mile disconnect in the road, the Darien Gap. People have crossed the gap on foot or in highly specialized 4WD vehicles with a bridge-building crew, but currently the border area between Panama and Colombia is both wild, uncharted jungle and home to various paramilitary and terrorist groups. So, for the next 5 days we'll be playing pirate - sailing the Caribbean, island-hopping through the San Blas Islands for 3 days before hitting the open sea for another 2 to arrive in Cartagena. Our car should arrive by cargo container about 3 days after us. For more info on the whole shipping process, we have detailed information on Drive the Americas.